« Change: A Friend or A Foe in Your Stepfamily? My husband, Randy, turns 50 years old today! He has been a stepparent to my two girls for 17 years. He will be the first to tell you he has done a lot of things wrong. But his stepdaughters love him dearly. Jodi (left) was almost three when we married and Jamie (right) was five. Randy had a difficult time with Jamie from the beginning. She didn’t want another dad in her life and she made that clear to him. He overheard a conversation between the two girls one night in the bathtub during our first year of marriage. “I hate him too, I can’t believe Mom married him,” Jamie told Jodi. There was little love, or even like, between Randy and the girls in the beginning. It was a tough season. Blending four children ages 3-10 and learning how to parent together was harder than we anticipated. But neither of us wanted to endure another divorce. Randy and I began counseling that year to work through the bumps. During her teen-age years, Jamie challenged us on every turn. If Randy punished her in any way, she threatened to call Child Protective Services. She ran away more times than I can remember (but thankfully never went far). And after one particularly aggravating day with defiant behavior, Randy took Jamie’s cell phone and threw it to the ground. As it busted into several pieces, Jamie began yelling at us both. The night didn’t end well. And I wasn’t sure the sun would come up the next day. But it did. And Randy didn’t give up on his stepparenting role with Jamie. When she came into driving age, Randy wanted to teach her to drive. She tested every ounce of his patience. They would come in from a driving session hardly talking to one another–Jamie’s anger brewing over. But the next day, they were at it again. During her high school years, Jamie participated in competitve cheerleading. Randy would jokingly say, “Do you call cheerleading a sport?” The ongoing drama with other cheerleaders, out-of-town competitions, and continuous suction cup to his wallet threw Randy into stress overdrive. His grumpiness overshadowed his joy at times. But he didn’t quit supporting Jamie and the things that made her tick. Do you have to be a perfect stepparent to have a meaningful relationship with your stepchildren? NO! 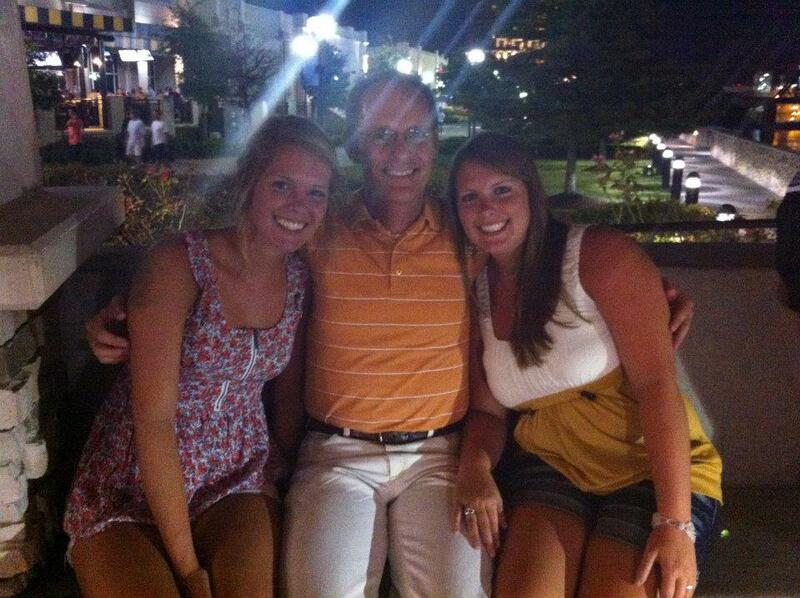 Randy’s stepdaughters, Jodi (19) and Jamie (22), love their imperfect stepdad. Why? How did that happen? When he fell down, he got up. He prayed some more. He sought help again. He struggled harder. He cried again. He forgave some more. But… he got up when he fell down. Is it a cycle? Yes. You take one step forward and two steps backward. You celebrate a season of growth, then start a season of despair. You gain the insider status one day and feel like an outcast the next. Does that mean you failed? You fail when you quit. The easy road is the quitter’s road. The majority of stepparents take that road. But if you signed up for the race, your stepchildren deserve a finish. I know it’s not easy. I know you want to quit. But you’ve been given an opportunity to influence a young child’s life like no one else can. In an imperfect way. Will you take the challenge? Will you commit to the journey? Will you get up when you fall down? I hope so. Because my husband will tell you: there are rewards to stepparenting, even when you’re not perfect…but they’re at the end of the journey. Gayla, this is such an encouraging blog to the season my husband and I are facing with his 3 kids. Thank you for the reminder – if we signed up for the race (step parenting), then our kids deserve a finish. Thank you Jan! As a runner, I know the finish line can sometimes seem so far off but it always shows up! I’m thankful you’re willing to get to the finish line, even though I know it’s not easy! Hang in there! Congrats to both of you for successfully navigating through the hard times, and making it to the finish line! Thank you Lisa! You’ll get there too! But you are exactly right, it’s not easy! God bless you in your stepparenting efforts friend. This brought me to tears. As a custodial stepmom to 3 for the past 8 years, I’ve felt like I’ve screwed up more times than I’ve gotten it right. As time goes on, though, it does get better – WAY better! Alternatively, as a child, my father made some huge, gigantic mistakes as a parent and I went through a period where I refused to speak to him. Today we have a pretty decent relationship and I attribute that 100% to the fact that he never gave up trying. Never. He’s not perfect, and that’s ok. Thank you for writing this. It allowed me to see the connection between my childhood and adult experiences, and relieve some of the guilt I inevitably feel for not being *perfect*. I read this post with tears pouring down my face. Thank you so much for sharing Randy’s story. I’ve been a stepmom since my SD was two years old (She’s seven now.) and there have definitely been times when I didn’t think I was strong enough to make it anymore. I stress a lot about her teenage years and fear the conflicts that your girls had with Randy, but I’m going to keep re-reading this post to give me the courage to go on. As I got to the end of your inspiring post, I found my most favorite scripture: “I can do all things through Christ who gives me strength.” Philippians 4:13. Thank you so much for every word of your post. Words don’t even begin to express the gratitude my heart feels right now – gratitude that I found your blog today. May God bless you and your family! Thank you! I’m glad my words were of comfort to you. Stepparenting is not an easy journey but there are rewards along the way if we don’t give up. Thank you for your comment. Thanks for writing this. I feel so alone in my struggle to make it work with my partner. Im 30 and want kids of my own but that’s a leap to take with someone that has 2 kids of his own. He is hesitant to have kids with me in case it doesn’t work out and he’s stuck being a single parent again. I sometimes think I should run but that would not be fair on the kids that have grown attached to me.. or on us as we love each other. Don’t give up. It gets easier with time. I don’t know your struggles but I can tell you I wanted to quit at times too. I’m so thankful I didn’t though now. You have time to have a child even if your partner wants to give it some more time. Hang in there and if you’re a believer – Pray! You can make it work but it does take time and a lot of self sacrifice. Thank you for your comment. Hope to hear from you again.